My neighbour Kate is one of those cooks who seems to be able to turn her hand to anything and everything. I shared her recipe for ‘The Ultimate Pumpkin Pie’ after tasting it at a Thanksgiving dinner. 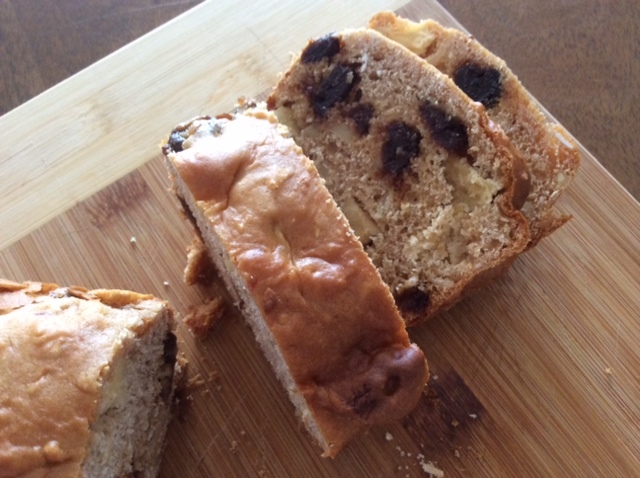 Most recently Kate treated me to a whole loaf of her favourite fruit bread. And of course I couldn’t resist asking her for the recipe. 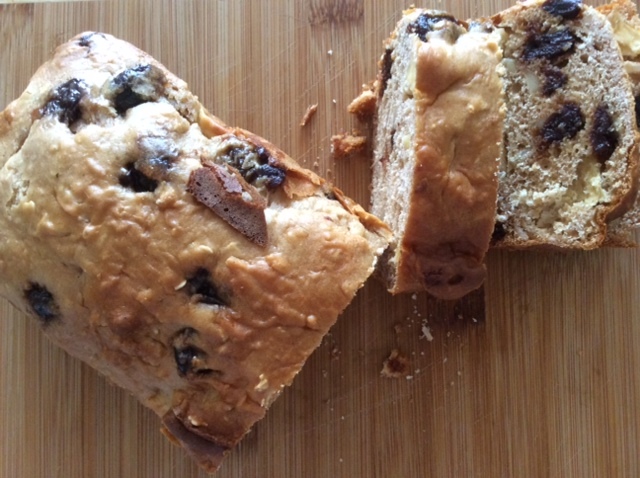 The great thing about this fruit loaf is that it uses everyday ingredients. It also stores well in the freezer for emergency breakfasts (which also helps in avoiding any temptation to eat more than a couple of slices in one go). Here I’m sharing Kate’s minor adaptations to a recipe from Bill Granger. It comes from his ‘Every Day’ cookbook. Kate explained how she adapts his original recipe to reduce the cost ‘- simply by replacing expensive dried cherries with cranberries or blueberries. 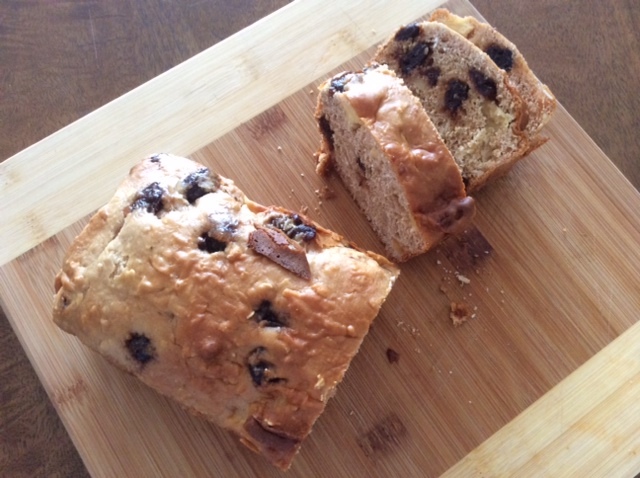 Although I could eat this fruit bread everyday I would restrain myself because of the added sugar. For me this would be a weekend treat served with some creamy fresh ricotta. When I asked Kate whether the brown sugar and honey could be substituted without drastically changing the end result she recommended using banana. I also think a natural sweetener like stevia may work. On a gluten free diet? Then you could also experiment with using a gluten free flour in place of the self-raising flour. And of course gluten free oats. Note – replace brown sugar and honey with one ripe banana (or 1-2 tbsp of stevia). Add the oats to a bowl and pour over the milk. Allow the oats to soak for 30 minutes. Sift the baking powder and flour into a bowl and then stir in all of the other ingredients (except the 2 tbsp almonds for topping). Give the mixture a good stir to ensure it’s evenly mixed. Grease and line a loaf tin that’s 1kg in size (equates to 13cm x 23cm) and then spoon the mixture into the tin. Once the mixture is level in the tin sprinkle over the extra almonds. Bake in the oven for 45 minutes or until it is cooked through with a golden brown topping. Once out of the oven give it time to cool a little before transferring it to a wire rack to finish cooling. Once cooled you can slice and then freeze whatever portion you want to keep aside. Toast before serving. Tags: bread, cake, fruit, loaf, oats, recipe. Bookmark the permalink.